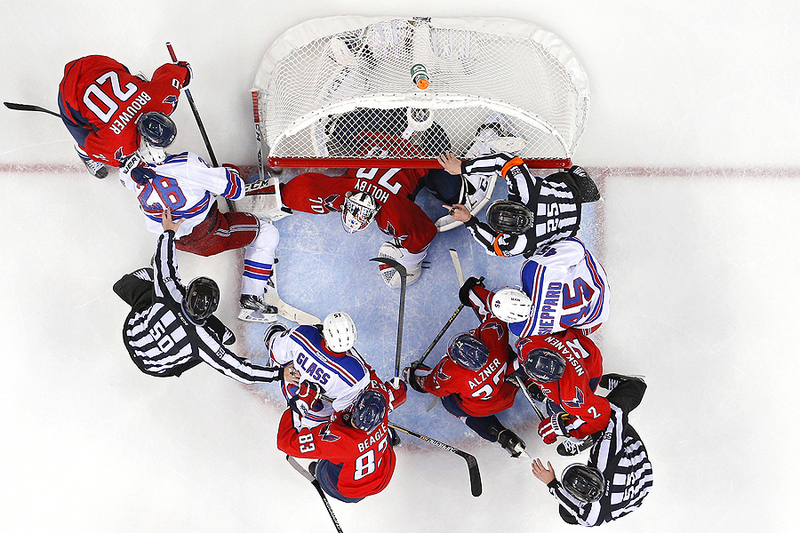 "Goalie Braden Holtby #70 of the Washington Capitals makes a save against the New York Rangers as players scuffle during the second period in Game Three of the Eastern Conference Semifinals during the 2015 NHL Stanley Cup Playoffs at Verizon Center on May 4, 2015 in Washington, DC." It's May, and to most, baseball is season is in full swing by now. However, in Washington, DC, the Capitals are hot pushing to advance once again in the Stanley Cup playoffs. No matter what the sport, playoffs means tensions are running high and players are willing to do whatever it takes to move onto the next round. The match-up between the New York Rangers and the Capitals has been nothing short of spectacular. Back and forth play, big hits and amazing goals. Here is to hoping that hockey continues on in the city of politics before summer is here.